Having recently discovered that our local grocery store carries prepared pizza dough (although it's practically hidden in a corner), Meredith decided it was time for us to slow down on our occasional frozen pizzas. Well, if we weren't going to have frozen pizzas, I didn't want us to stick to a standard pizza. My mother's friend used to make us a great tasting potato pizza, and I wanted us to try something along those lines. This particular project ended up being a joint-effort for Meredith and I, where I prepared the topping and Meredith made sure the pizza actually looked and tasted like a pizza (toppings placed correctly, baked without getting burnt, etc.). What made this recipe taste so great was the carmelized onions combined with the rosemary. We used the entire package of dough for a single pizza when, in hindsight, we could've spread it out into two thinner pizzas (requiring you to double the recipe for the toppings). In a medium skillet, heat oil over medium heat and add onion, garlic and rosemary. Stir occasionally for around 15 minutes, until onions carmelize. If onions start to brown, burn, turn heat down a little. Roll out the pizza dough on a pizza pan or baking sheet and sprinkle the 1 tbsp Parmesan over the dough. 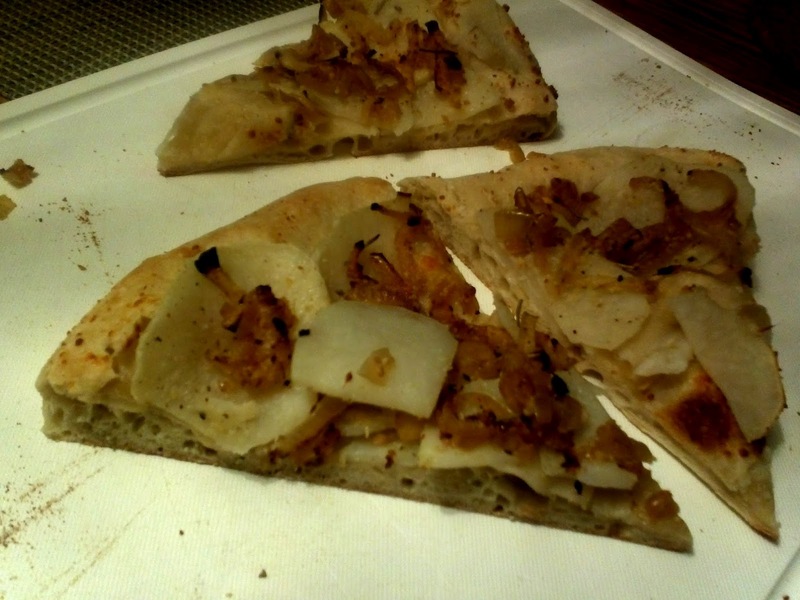 Arrange the potato slices on the dough, with the pieces slightly overlapping. Spoon on the onion mixture and sprinkle on the salt, pepper, and remaining Parmesan. Bake for 12-15 minutes, or until crust is crisp. Potato on pizza? I've never heard of that before, sounds good! Nice and carby. I'm actually shocked that you've never encountered a variation of this - it looks like it's right up your alley. I think you'll really like it. (and yes, super carby). This sounds really good, I know it seems odd (perhaps) potatoes on bread, but carb on carb is ususlly delicious! I want to make this, thanks. I have yet to taste this pizza, but I am sure is delicious. I know my husband will love it! Have a great weekend Daniel. I agree with Melynda---give me some carbs on carbs on carbs any day and I am happy! Are potatoes bad with anything? Homemade Pizza sounds devine. Yum!